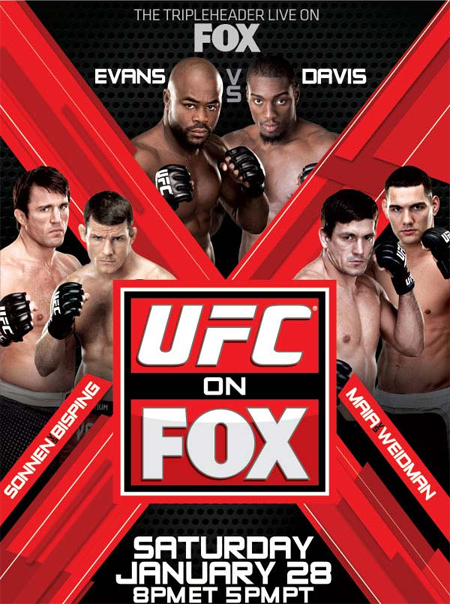 With a simple cut and paste job, it was as though Mark Munoz was never set to co-headline “UFC on FOX: Evans vs. Davis” opposite Chael Sonnen. With Munoz’s abrupt exit from the January 28th event, Michael Bisping’s image was simply slid across to the left, then Chris Weidman was placed beside Demian Maia, and just like that the official poster for the show is once again complete. Munoz was slated for face Sonnen until an elbow injury forced him to withdraw on Tuesday. Bisping, who was originally scheduled to fight Maia, was subsequently promoted to the middleweight top contender bout against Uncle Chael. Weidmen was then called up from the bullpen at the 11th hour to confront Maia in the third fight airing live on FOX. The United Center in Chicago, Illinois hosts the Octagon’s return to primetime television. Light heavyweights Phil Davis and Rashad Evans will headline the festivities. The FOX broadcast airs live at 8PM ET/5PM PT.